Sakai Guides and DocumentationSakai Complete User Guide Sign-UpHow do I view meetings in Sign-Up? Click on a meeting title to bring up its meeting details. Detailed settings and timeslots, for a particular meeting, are listed here. The meeting details can be modified or copied into a new meeting, or exported or printed. In the Time Slot table, timeslots can be edited. 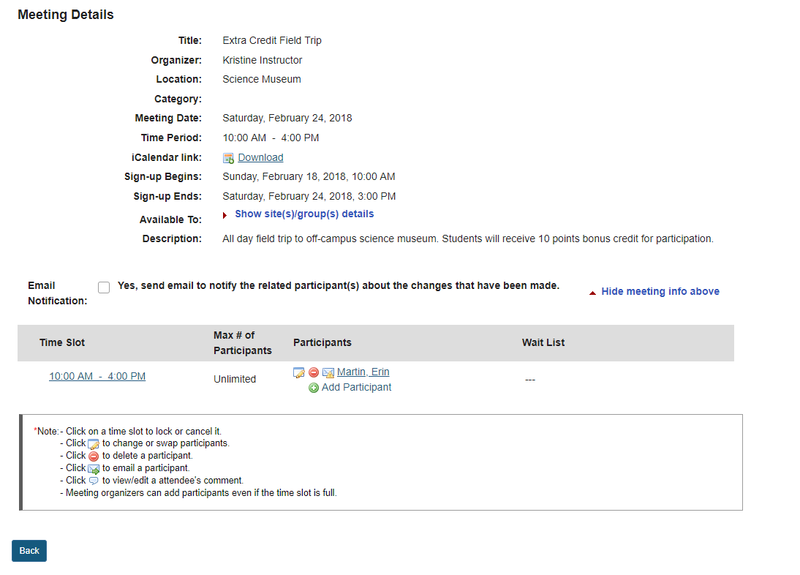 The organizer view shows those signed up and those on the waitlist; the student or participant view shows a “Sign-up” button, active if the sign-up period has commenced. Prev: What are Sign-Up meeting types? Next: How do I create a meeting?